Productivity metrics and First Response SLA Reports. Metrics: average first response time, number of replies it took to close the ticket, and ticket closing time. 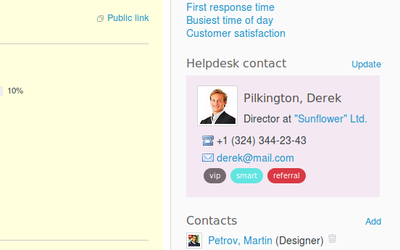 Helpdesk plugin is fully integrated with the Redmine issues module and the CRM plugin. Looking at an issue, you see all client information with tags, contact information, and previous tickets. All related contacts can be used to generate a CC list and also send messages to them. Now you can respond to the ticket right from the Issues view page with one click. 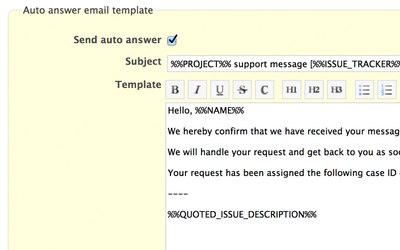 The reply will send email that will use header and footer templates with macros that can include the ticket ID or name and surname of the person who answered the message. The Helpdesk plugin extends functionality of the Issues List so that you can use filters to effortlessly select all customer issues as well as a particular one. Plus, you can add new fields to the Issues Table with customer information and last ticket message copy. You can create autoresponders for a customer's first message and easily custimize it with templates and styles, but that's not all. The response header and footer can be modified using customer, ticket, or user macros data. 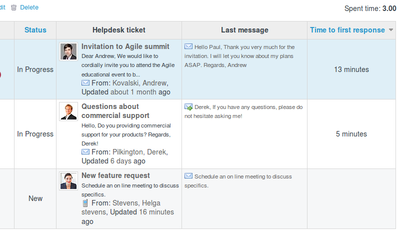 With the Helpdesk Widget, your employees and customers can send inquiries or set tickets from any page inside or outside Redmine. You can customize fields you want to be displayed as well as prepopulate them with content. It can include using the URL address of a page, status, product ID, and more. 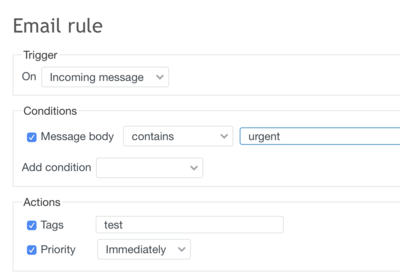 You can now set up email rules for incoming and outgoing messages automatically. It updates the ticket fields and let you organize and priorite your team works more efficiently. As an example you can set a High Priority to messages coming with word "urgent" in the subjest or body message, or from a certain client. Note: You need to install our free CRM plugin to use Helpdesk. You now need to restart Redmine so that it shows the newly installed plugin in the list of installed plugins ("Administration -> Plugins"). Go to "Administration -> Helpdesk" and configure global plugin settings. Compatible with Redmine 3.4.x, 3.3.x, 3.2.x, 3.1.x, 3.0.x, 2.6.x, 2.5.x, 2.4.x, 2.3.x. Compatible with Redmine 3.3.x, 3.2.x, 3.1.x, 3.0.x, 2.6.x, 2.5.x, 2.4.x, 2.3.x. Compatible with Redmine 3.1.x, 3.0.x, 2.6.x, 2.5.x, 2.3.x. Compatible with Redmine 3.0.x, 2.6.x, 2.5.x, 2.4.x, 2.3.x. Great plugin! It's easy way to upgrade your Redmine up to powerfull helpdesk. 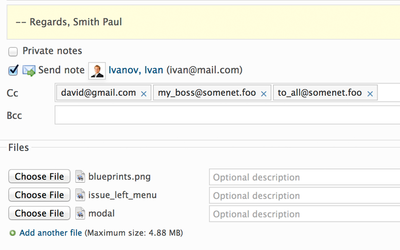 Alltogether with another the developer's plugins and Redmine's essential features I got full-value Service Desk. Good plugin, have very nice features and is easy to use. A must have if using redmine for customer support. REST API makes integration easy. Fast and helpful plugin support. a wonderful plugin and the update's feature is fine.